Under an hour in Target? No way! 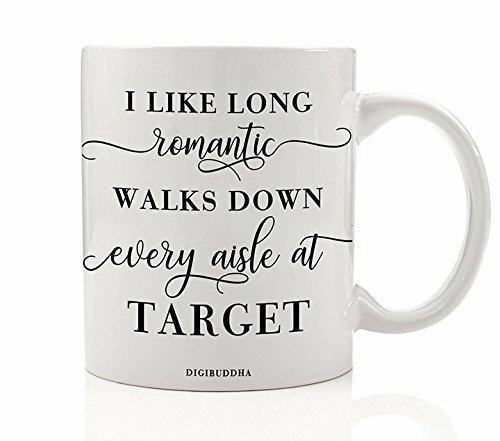 This fun mug has the quote "I like long romantic walks down every aisle at Target" in black lettering designed to stand out. This is a great gift or collector's item for the frequent beverage drinker. Digibuddha Mugs are custom created in-house by professional designers exclusively for Digibuddha. All production, packaging and shipping is also done on the premises by our small team. We truly love what we do and it shows! · 100% MONEY BACK GUARANTEE: We're sure you won't find a better product for the value anywhere else. If you aren't happy with your purchase for any reason, reach out to us and we'll make it right with our 100% money back guarantee! Our mugs are made using fine white ceramic with a flawless glossy glaze finish. Each original custom made mug is permanently fused so the art becomes part of the mug, NOT decals or stickers. Microwave & top rack dishwasher safe. We have been in business since 2011 with tens of thousands of happy customers! We truly love what we do and it shows! With our 100% MONEY BACK GUARANTEE, your order is truly risk-free. Combined with our long history of quality products and excellent value, Digibuddha mugs are the perfect choice! If you have any questions about this product by Digibuddha, contact us by completing and submitting the form below. If you are looking for a specif part number, please include it with your message.